The Shepherdess Cafe can be found on City Road between Old Street and Angel. 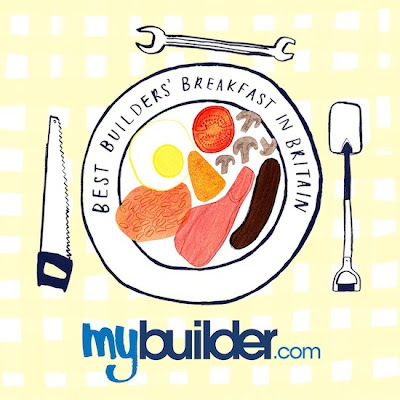 Having been voted best builders breakfast in Britain 2012 I just had to try it out for myself. Breakfasts are available everyday except Sundays. The cafe also sells a selection of crisps, sweets and cold drinks. On the wall are photos of celebtities who had visited The Shepherdess over the years. An unusual touch is the curtains painted onto each window. The cafe is quite large with plenty of tables beside the window. The menu had plenty of breakfast options but a full English containing all the key items would have been nice. Sugar dispensers and sauce bottles don't get much better than this! The coffee was good and reasonably priced at £1.30. Buttered toast was available at 45p a slice, I am still kicking myself for not spotting the fried slice on the menu till after I had ordered though..
Everything filled the oval plate quite nicely and on this occasion I chose real tomatoes over tinned. There were plenty of mushrooms and the bacon was excellent. The fried eggs were perfect and the chip garnish an unexpected bonus. The severed edged jumbo sausage didn't taste very special. The Lemon Tree Cafe can be found on Damgate Street. It seemed a very popular place and soon filled up with customers. The building is stunning and the decor very traditional. You won't spend too long pondering over the menu. Salt, pepper and sugar is already on the table, ketchup arrives later. I was pleasantly surprised when the breakfast arrived, it looked great! A quality sausage and proper mushrooms. The potato slices were a bonus that are not mentioned on the menu and the fried egg was perfect. Beans in a bowl are growing on me, piping hot and pour them exactly where you want them. This is the vegetarian breakfast with a nice tasting veggie sausage and crisp hash browns. Veggie option - Yes, Vegetarian sausage, 1 egg, mushrooms, tomato, 2 hash browns, beans and toast & butter for £5.25. We sat on the same table again by the back door. The area by the back door is quite cosy and warm. It was far to cold to be sitting outside but looks great for the summer. A quick Game of Life whilst the sausages are cooking? A large breakfast with toast and a hot drink for £6.95 seemed like a great deal. You can chose from tea or coffee. Sugar lumps in a bowl, nice! Plenty of piping hot toast served with real butter. Very colourful and nicely presented. 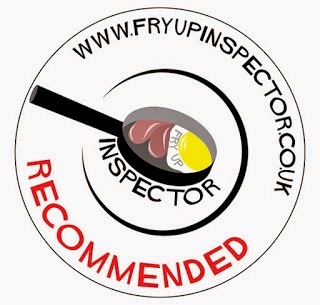 Excellent fried eggs and mushrooms. Quality bacon and sausages and sweet tasting tomatoes.